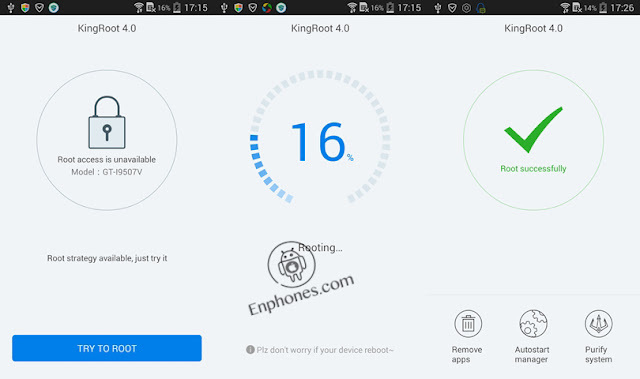 The following guide show you how root your Samsung Galaxy Grand Prime, they are a lot of methods that you can use to root the SM-G530R4 and the SM-G530H versions of the device, here we talking about root samsung Galaxy Grand Prime without pc using KingoRoot. Please, note that Rooting is usually safe, but there is always a chance that something could go wrong. make sure that you follow our instructions carefully, also don't forget to read "What is Root or Rooting Android Phone?" article. 2. Install KingoRoot on your Galaxy Grand Prime device. 4. Now just wait for the result. KingoRoot is very user-friendly and easy to use. is the best "One Click Root" app to root any android device.